New Orleans was founded in 1718, at the swampy foot of France's huge Louisiana territory, and named after the Duc d'Orléans. Despite hurricanes, mosquitoes, disease and floods, settlers came and the city prospered, mainly thanks to its position at the mouth of the Mississippi River. In 1762, the territory was secretly ceded to Spain. Drawn by rich plantations and a thriving port, the Americans came seeking their fortunes. During the 19th century, New Orleans boomed with cotton and sugar trade, and by 1860 it was the wealthiest city in the country. The region’s fortunes were to be dealt a fierce blow after the Civil War (1861-65) as the area’s slave-based, agricultural economy declined. Regeneration was not far away, though, and the 1890s saw the introduction of an advanced public transport system. The city was seen as having a progressive, liberal society with a relatively well-educated black population. The turn of the century also saw the glory days of Storyville, the semi-legal red light district that ushered in New Orleans' reputation as an entertainment hub. Its legacy is still evident in the glitter and neon of Bourbon Street, where strip clubs have replaced brothels but the air of decadence still hangs heavy. The various nationalities that once occupied the city never really left, and even in the early 20th century, the population still had a sizeable proportion of Francophones. By the 1920s, Storyville had been shut down, and vigorous efforts were made architecturally and socially to modernise the city. Despite hurricane season having periodic effects on the city, with floods in 1927 and 1947, the metropolitan sprawl still grew nonetheless and the population continued to expand. Present-day New Orleans has unarguably been shaped by the effects of Hurricane Katrina in 2005. The levee system failed, and it became one of the largest disasters in American history. A huge chunk of the populace was displaced, and even some years later, the city is still under populated. However, tourism has once again reached pre-Katrina levels, and new businesses and attractions appear every year as the city enjoys a period of development and innovation. 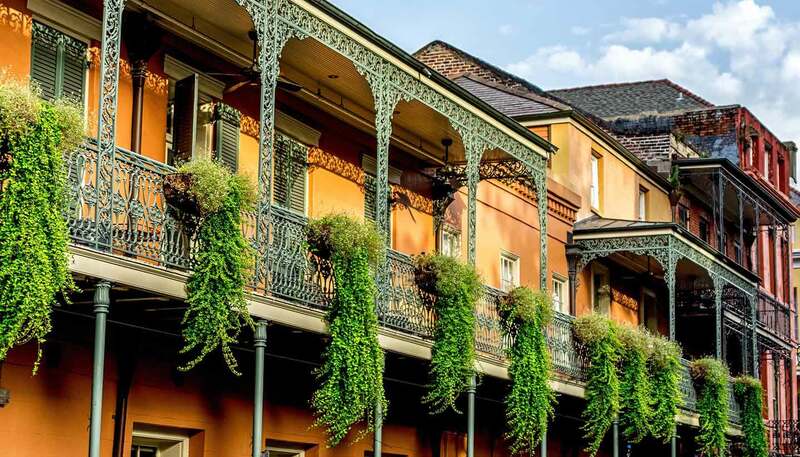 • After ceding New Orleans to Spain, the city belonged to the French for just 20 days in 1803 before they sold it to the US as part of the Louisiana Purchase. • Built in 1955, the Lake Pontchartrain Causeway Bridge is the world's longest bridge over a body of water. • When Jean-Baptiste Le Moyne founded New Orleans in 1718, he chose the spot as he thought it would be safe from hurricanes and tidal surges.